Last Friday night was another bookish bloggers gathering to celebrate two Birthdays. Wokay wokay...Mommy Ling is not exactly bookish but she certainly read got read books la. Heard she got the whole set of Wimpy Kids Diary. Too bad Auntie Claire can't come coz she sure would love it. 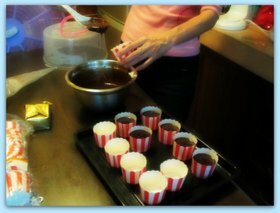 That afternoon, the two of them were busy preparing these. Papa brought along "Ribena" for everyone. Alamak...someone asked in Facebook "Whose one got burn" pulak. Drink already will wiwangwang one. Yuck! Me one sip enough liao. Claypot Curry Fish Head. Super spicy. Claypot Loh Shi Fun(Mouse Tail Noodles??). Hmm...this round a bit too watery pulak. Usually very good. Must eat while it's still hot. Salted Eggs Crabs. Yumm yumm ...a lot of meat and a lot of roe. Portion a bit big or maybe the other table are small eaters? Mamarazzi tapau-ed home. And time to "kacau" Papa pulak. Aiyak...the two Birthday "Aunties" still busy chatting pulak. Finally I got to eat the cupcakes. Hmm...this is seriously delicious. It's those type that "melts in your mouth, not in you hand" type of deliciousness. Must go bodek for more. That night, Mamarazzi was too wiwangwang to open the gifts. Pirate Treasure Box with pretty pearls inside. Mmmm.....Gift Vouchers...BookXcess. Mmmm......just nice....BookXcess is having World Book Day Promotion till 1st May. Great time to utilise these Vouchers. 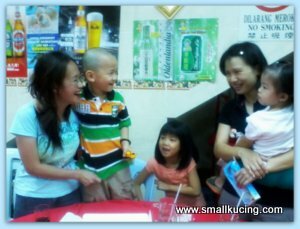 Mamarazzi said thank you to Auntie Alice, Auntie Chee Yee, Mommy Ling and Auntie Little Bird for the gifts and lovely evening. You all really had a good time.. Is been a while i had cup cakes, hope to buy some soon.. The kangkung Belacan looks really delicious, is my kind of food..
Auntie Cheeyee and auntie alice... fuiyoo.. the fondant and tiramisu cupcake... world class. 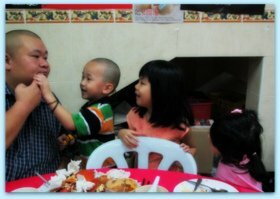 =D Must bodek bodek them summore soon. LOL! Who bought her the shorts? Your papa kah? Hmmmm....!!! LOL!!! wah, so good, got so many bloggers celebrated birthday for mamarazzi.. Sedap!! All the food.. esp the crabs and roe..gosh! too bad i stay too far away... eh..July 13th.. how? coming or not your gang gang? liese hair apricot color is good :) try it out soon! Hahaha! It's fun reading your post. The food makes me hungry! Happy birthday Mamarazzi!! Here's a big hug from witch down under! :) many many happy returns! 'Ribena'!! can i have a taste of that please? Whoa craving for loh shi fun, ling time didnt eat that noodle leh... nice or not?? Happy belated birthday to Mamarazzi! Used the BX voucher already? We just went there today ;) Burned small hole in the pocket hehe.. I hope it's not to late to wish you Happy Birthday! Yea...it will be nice if the lao shu fun not that watery. Others were good. Thanks to Paparazzi for the dinner treat! Happy Belated Birthday!! Great celebration with all the nice food. Love the cupcakes. Even had liese hair dye! :D Mamarazzi should try it soon. Book Xcess vouchers :OOOO I also want!! By the way I love your haircut. What to do; my barber went bankrupt. Maybe I should do my hair by my self. How Do You Like Your Porridge?